In this worksheet, students will get an explanation of how and why individuals of the same species show variation in their characteristics. Differences between organisms are known as variation. There is a lot of variation between different types of animals. Organisms that share common characteristics belong to the same species, but there is variation even between organisms of the same species. Organisms of the same species can reproduce with one another and produce offspring that can also reproduce. For example, horses and donkeys belong to different species. Nevertheless, they can reproduce with each other, because they belong to the same family, and they produce mules. Mules cannot reproduce, because horses and donkeys do not belong to the same species and mules are not a species themselves. Variation can be inherited, when offspring take features from their parents. Half of the information we inherit comes from the mother and half from the father. So, children have features from both parents, but the mix is different in each child. Natural eye colour and ear shape are two examples. However, environmental factors (rainfall, sunshine and chemicals) cause variation, too. This is environmental variation. Using hair dyes to change your hair colour is an example of environmental variation. Variation can be continuous, when there is range of values, like height. Usually, in this type of variation, the values can take any number. In the example of height, the value can be any height between a few centimetres and just above two metres, which are the normal heights found amongst humans. 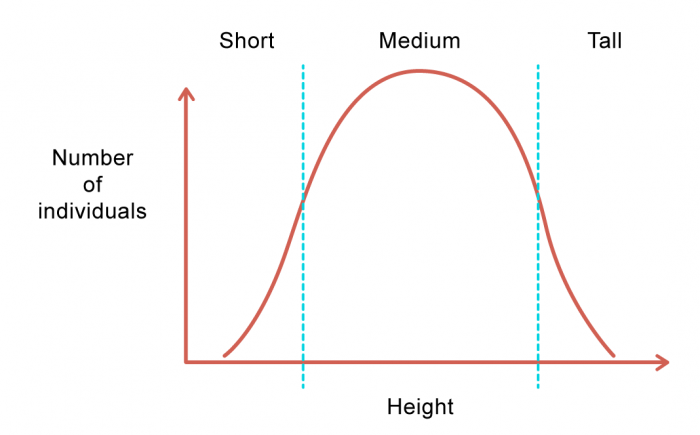 The graph shows a normal distribution curve for height. Continuous variation graphs should be line graphs. When there is not a continuous range of values, for example, blood type or eye colour, the variation is discontinuous. Discontinuous variation values are plotted on a bar graph (see graph below). What do we call the differences between organisms? What do we call the group of organisms that share the same characteristics? What do we call organisms that are produced by their parents? Tick two species that can reproduce with each other. 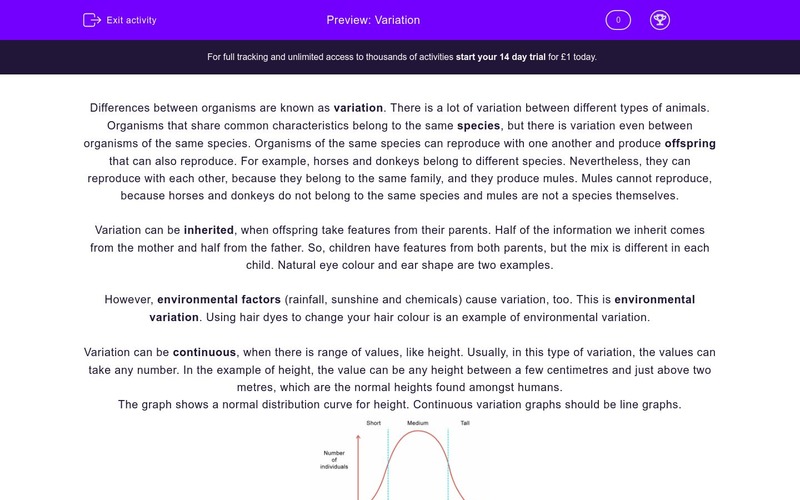 Give an example of inherited variation. 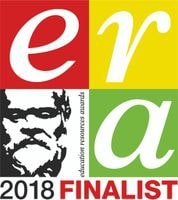 Give an example of environmental variation. Give an example of continuous variation. Give an example of discontinuous variation. Give another example of discontinuous variation. Differences between organisms are called variation. Organisms that share the same characteristics belong to the same species. Organisms that are produced by their parents are called offspring. Horses and donkeys can reproduce with each other. Eye colour is an example of inherited variation. A scar is an example of environmental variation. Hair colour is affected by both inherited and environmental factors. Height is an example of continuous variation. Eye colour is an example of discontinuous variation. 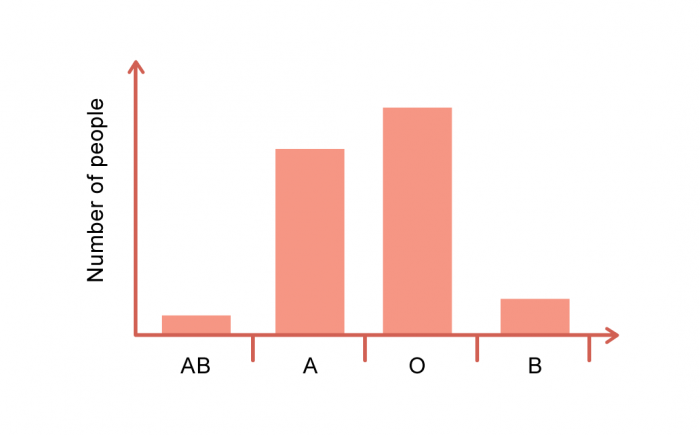 Blood type is another example of discontinuous variation. Rainfall and sunshine are two environmental factors.